Both winners clocked world leading 25km times but high temperatures made it impossible for any records to be approached. Lucy Kabuu's winning time is still the third fastest ever run at this distance. Among all running events 10,901 runners were registered. A fast race developed after the start in front of the Olympic Stadium. In the final uphill part Sigei broke away from the leading group and built a significant lead. Lucy Kabuu ran at her own fast pace and Kenyans filled the first four places. This year's race featured a new course and the addition of a Half Marathon and attracted over 4,500 participants. Botswana athletes Godiraone Nthomphe and Shepherd Kenatshele claimed victory in the 21km and 10 km men's races, with Zimbabwean Faith Nyasango winning the women's half and Helalia Johannes (NAM) the 10km. The race enjoyed entertainment from national icon and DJ "Big Fish" and performances by well-known Botswana artists, including Scar. Proudly displaying his trophy, Kenyan men's winner Luke Chelimo said: "The course is good and flat but wind at the start slowed the pace." Eliud Kiplagat set a new course record while Joan Rotich successfully defended her title. A record field of 6789 runners from 60 nations — about 1000 more than ever before — registered for one of the races in the 10th edition and enjoyed a bright day in Mozart's home town. The previous day nearly 1700 kids and teenagers had contested the Coca-Cola Junior-Marathon, another participation record. 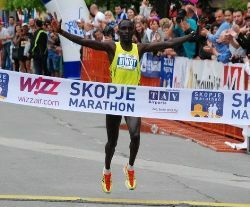 Kiplagat made it 10 out of 10 in Salzburg when he took victory at the Residenzplatz finish in the historic centre. His time is the best achieved in Salzburg by 34 seconds. It was John Kirui who launched the first attack at 30km and won a significant lead but Kiplagat closed the gap by 40km and went on to "the biggest success in my career so far. 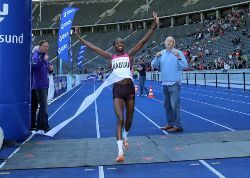 It was a superb race, a great atmosphere"
Joan Rotich won back-to-back editions, the first time this has been achieved in Salzburg. She had no one on her level and crossed the finish line only two seconds slower than last year. Benedikt Fritz and Christine Fiedler, both from Germany, won the half marathons and were full of praise for the race: "[It] was perfect. There was a great atmosphere, there were so many people cheering us on." Austrian Thomas Geierspichler, a two time Paralympic champion, contested the half marathon distance in his wheelchair. 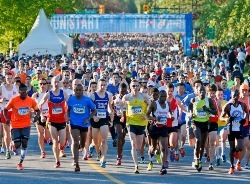 Under brilliant sunny skies the 42nd edition had 16,390 runners registered in all four events. Thomas Omwenga became the four-time men's Marathon champion, besting Benard Onsare, who had led a pack of four runners for much of the pace before dropping off in the final kilometre. 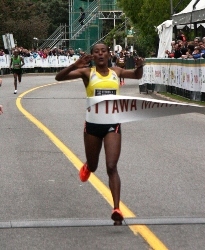 Lucy Njeri from Kenya but living in Toronto took the women's title. 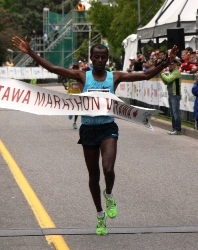 In the Half Marathon Paul Kimugul set a new course record by a margin of 30 seconds. Local runner, Natasha Fraser defended her women's title. The exuberant runners and walkers in the Full, Half, 8km and Kids 1-mile Fun Run races represented 43 countries including New Zealand, Australia, China, Fiji, Germany, Japan, and Bangladesh. Over 3,000 entrants signed up on Bank Holiday Monday with runners from all over the UK, Europe and the rest of the world. The course took in tree-lined city centre boulevards and beautiful scenic lakes. The weather was glorious sunshine and spectators came out in force to cheer on the runners to the finish a within Stadium MK, home of MK Dons Football Club. The Mayor of Milton Keynes got the runners on their way after a 30-second silence in memory of the Boston Marathon bombing victims. After the main race it was the turn of the Superhero Fun Runners who turned out in force to run 2.6km and experience the thrill of crossing the finish line as a hero. Popular costumes were Batman and Spiderman, two Star Wars Storm Troopers from the UK Garrison led the runners over the start line of the race. Nicholas Kemboi and Caroline Rotich celebrated their biggest career wins. Kemboi, Kenyan by birth but now running for Qatar triumphed in warm (over 20°C) and sunny conditions. 9,500 runners entered the Marathon. Kemboi was not among the favourites and could have been mistaken for a pacemaker as he led for most of the time after 16km when he, pacemaker Silas Ngetich, Julius Lomerinyang and Girmay Birhanu (Ethiopia) broke up the big leading group. The pacemaker soon dropped but the other three passed halfway in 63:21. After 30km (1:30:36) Kemboi dropped back but soon regained contact and started to push himself. Birhanu dropped fell behind at 34km and 2km later so did Lomerinyang. Qualification for major championships is the reason why Kemboi runs for Qatar instead of Kenya. In 2003 as a 19 year-old he ran 26:30 for 10,000m — still the fourth fastest 10,000m runner ever, but he now concentrates on road running. Caroline Rotich, course record holder Lydia Cheromei and Philes Ongori passed halfway in 1:13:03. Soon after Rotich broke away and established a substantial lead. In contrast Cheromei, who had a hip problem during her build-up dropped back to finish a disappointing sixth. Ehitu Kiros overtook Philes Ongori at around 25km but Ongori came back past her. The weather was conducive to running, and rain-free conditions boosted the number of spectators spontaneously cheering all along the route. The race, starting in Katowice, attracts increasing numbers each year. The honorary starter was MEP (former head of the European Parliament) Prof. Jerzy Buzek, who appeared at the start wearing a commemorative T-shirt that he had received from the organizers five years before when he started the first Silesia Marathon. The course presents the diversity of Silesia, traversing three cities and finishing in one of the largest parks in Europe. This year's edition attracted runners from Germany, the Netherlands, USA, South Korea, Belarus, Spain and the United Kingdom. With nine well-supplied refreshment stations along the route, and a commemorative medal and food package being presented to finishers Silesia Marathon showed once again that despite its modest budget, it is a really great race. The 9th edition attracted a record number of 4900 participants in all four events, coming from all continents. New course records were set by both male and female marathon winners. The Macedonian national championship was won by Riste Lazaro and Vesna Kiradjieva. Conditions were good (16°C and intermittent light rain). The Marathon was attended by many Macedonian celebrities, including worldwide fashion model and actress Katarina Ivanovska. In this year's largest-ever edition of 2600 participants from 54 countries both men's and women's course records were broken. Five members of the Salomon Racing team made the trip to the small village of Huangyuguan and showed what is possible on this tough adventure running course when mountain, trail and ultra runners of the highest calibre tackle the Wall. The team boasted six-time World Mountain Running champion Jonathan Wyatt, Greek Marathon champion Dimitris Theodorakakos, third finisher in the Italian Marathon Championships Silvia Serafini and the recent winner of the Leadville 100 miler in the USA, Tina Lewis. The often challenging weather at the Great Wall never materialised and runners were greeted with the coolest conditions experienced at the Wall in the race's 14-year history. Jorge Maravilla of the USA, Wyatt and Theodorakakos paced each other for the full distance and crossed the line in a staged triple deadheat. Their finish time sliced 9:30 off the race record. On the women's side, Salomon runners Serafini and Lewis raced to a new course record, with Serafini slashing over 18 minutes from Sara Winter's 2007 mark. The course features 5164 steps on the wall itself, but when asked Theodorakakos said he believed a sub 3-hour time was possible, "if this year's conditions can be replicated". In comparatively cool and cloudy but humid conditions neither the men's nor women's course record fell despite the competitive field assembled. Cautious racing on the part of leading contenders meant that they remained in large lead groups well into the race, with flat-out effort being reserved for the final slightly downhill section after 7.5km, where the finishing order was determined before the final 350m on the track at the stadium finish. Five-time World Half Marathon champion Zersenay Tadese blasted through the first 5km in 14:14 and kept going at the same pace through 10km by which time he was 15 seconds up on Martin Mathathi. He slowed only marginally in the second half of the race, and continued to maintain his lead, extending it further in the last kilometre even though Jacob Wanjuku was pushing Mathathi hard at the end. Mestawet Tufa was matched stride for stride by Eunice Kirwa until the final kilometre, when Tufa edged ahead. Due to a course marshaling error when runners were directed into the stadium instead of completing a final 5km loop, the course run was only about 37km. It was decided that no times would be published for the Marathon, only finishing positions (as below). 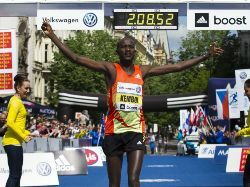 Daniel Wanjiru finished ahead of 1500 enthusiastic runners in the inaugural edition of this RunCzech event writes Tomas Nohjl. A further 600 participants completed the 3km Mattoni Family Run held earlier. 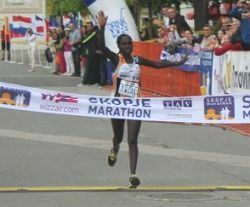 Wanjiru, who regularly trains in the Austrian Alps, appreciated the undulating course, but could not shake off 20-year old Fekru Feyisa until the final 200m sprint along the banks of the River Teplá. Feyisa commented "I had no idea what to expect from such a long race." 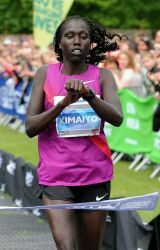 His sister, 16-year old Mame Feyse, triumphed in the women's race. The first Czech, Ondrej Fejfar, ran most of the race alone but missed out on a personal best by only four seconds. Ivana Sekyirova from the nearby town of Sokolov, kept her rival Petra Kaminkova off the top spot, after having picked up the European Veteran 10km title the day before in the town of Úpice. On the morning of the race she took part in the cross-country relay as part of the winning team before driving over to Karlovy Vary for the half marathon in which she edged ahead of Kaminkova in the last 4km. Local spectators saw a truly euphoric City Mayor of Karlovy Vary, Petr Kulhánek, cross the finish line. Two weeks after completing BMW Prague Marathon in 3:33 he managed to improve his half marathon best to 1:35. "Unbelievable and amazing, great," he commented. "The atmosphere and the people put me in the right frame of mind" he said. The RunCzech Running League heads to South Bohemia in two weeks' time for the Mattoni Ceské Budejovice Half Marathon. The course was hilly and tough and the race was held in sunny and hot weather. 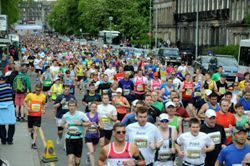 The Scottish capital staged a spectacular sporting weekend with more than 29,000 people taking part in the Edinburgh Marathon Festival. Runners from more than 100 countries enjoyed glorious sunshine. They included Kenny Heney, a 37-year old Scot resident in Dubai. He made full use of his weekend, completing all four adult races and clocking up a total of 77km. He ran the half marathon in 1:24 then jumped on a motorbike back into the city centre in the nick of time to run the full marathon. He completed the EMF 10km the previous day in 39:05 and the 5km in 19:21. He was exhausted but elated when he crossed the Marathon finish line in 3:00:57. 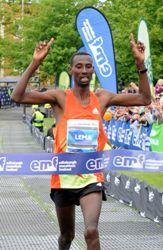 Overall winner Tola Lema finished only six seconds off the course record, still held by Zachary Kihara of Kenya from 2005. Ryan Beattie became the first Scot to win the half marathon, in the first race the 26-year-old has ever won. 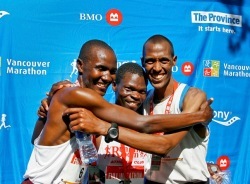 Tariku Jufar cut more than a minute off the course record set last year by Kenyan Laban Moiben. In an almost neck and neck finish, Jufar was followed by 24-year-old Kenyan Luka Rotich, who had entered the race as a pacer, but with his job completed he decided to compete to the finish. Rotich had paced Jufar to 35km, but Jufar surged ahead at 39km. He later slowed but still secured the course record with Rotich just behind him. There was one Canadian in the top-10, Vancouver-based Rob Watson, who was registered for the 10km, but switched to the marathon two days before and went on to win this year's Canadian Marathon Championships. 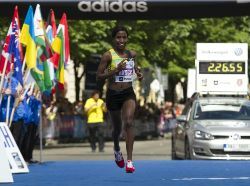 Ethiopians also dominated the women's elite field, with six placing in the top 10 and Yeshi Esayias slicing more than two minutes off the four-year old course record. Half a dozen women stayed together in a tight lead pack for most of the race, and the first three all surpassed the old record. Finishing eighth overall among women, Lioudmila Kortchaguina, 41, finished as the first Canadian for the sixth time since 2002. She was also the first master.